On 6 February 2013, Delhi University was rocked by two related events. The first of these was the visit to the university campus by Narendra Modi, Chief Minister of Gujarat. The second was the brutal and unprovoked action undertaken by the Delhi Police against protestors to this visit, on a scale probably unprecedented in the history of the university. Modi is widely known as the mastermind of the 2002 genocide in Gujarat; as a champion of anti-people, anti-poor policies; and as a promoter and benefactor of predatory and deeply corrupt big business houses. Many in the university immediately saw the visit for what it was – a blatant misuse of the university space to promote these condemnable agendas, with Modi as their champion, in the name of lecturing on “development”. Therefore, several groups and organizations of students and teachers who wished to express their opposition to this, gathered outside Sri Ram College of Commerce on that day, in a peaceful and completely legitimate expression of protest. Suddenly and without the slightest provocation, hundreds of protesting students and teachers were brutally and repeatedly lathi-charged by the police with no prior warning. RANCHI: Real life Rajan and Juhi have given the thumbs up to Prakash Jha for zooming in on their cause for the big screen and putting it in the right perspective in the film, "Chakravyuh". Though it could be a coincidence but the Maoist group operative in west Champaran district in Bihar, which is the native of Jha, the producer-director of the film, has a senior leader by the name of Rajan and also a woman cadre named Juhi as has been shown in the film. The Madhya Zonal Committee spokesperson of the CPI Maoists, Paramjeet, who has expressed gratitude for the film has, however, pointed out a few facts which are not in consonance with "their world". Madhya Zonal Committee is operative in Bihar and covers Baraharwa village in Bettiah, the home town of Jha. New Delhi, Oct 14 (IANS) As India witnessed a “long march” by thousands of tribals, farmers and landless people for land reforms, P.V. Rajagopal, who led the movement, said a new form of zamindari is emerging in India with corporates acquiring huge chunks of land. Zamindari, the pre-colonial practice of having landlords to collect tax from farmers, was abolished post independence in India. Rajagopal, however, warned that with large areas of land being acquired by corporates, a fresh form of the medieval system may emerge. “The situation is very bad. Corporates have become the new zamindars and a few people are accumulating all the land,” Rajagopal, founder of people’s movement Ekta Parishad, told IANS in an interview on the phone from Agra where the members of the group were stationed. RANCHI: The makers of the movie 'Chakravyuh' may have anticipated a good response to their film, which highlights the plight of common man owing to rising prices through the song 'Mehangai', but little did they know that the Maoists, on whom the film is based, would lap it up as well. Maoists operating in Bihar and Jharkhand have hailed the effort of the filmmakers and congratulated them for vociferously criticizing the corporate houses of pursuing their vested interests. See, below, four articles on Sushil Roy: -- an appeal for justice and humanitarian medical release; -- an interview on current CPI(Maoist) political relations;-- a brief biographic note;-- and a 2006 letter written soon after Sushil Roy's arrest, challenging the CPI(M)'s parliamentary road and the WB "Left Front" repression of revolutionaries. Septuagenarian Maoist Sushil Roy, known as Comrade Som, who is one of the two oldest political prisoners of the India at present, an inmate of Giridih Mandal Kara (district level jail), has been admitted to All India Institute of Medical Sciences (AIIMS) after being brought from a ward at RIMS, a government medical hospital at Ranchi of Jharkhand. He was shifted from the jail to hospital after an inordinate delay first to RIMS in Ranchi, when he was not able to swallow any food for over 10 days and had become extremely weak and virtually crippled as a result of his medical history and cruel neglect of medical treatment for 7 years in jails. This delay was caused by the refusal of the Jharkhand police to provide him a secure mode of transport from Giridih jail to Ranchi. Had it not been for the hue and cry raised by several people's organizations and his younger brother, Dr. Shyamal Roy, who happens to be his only close relative, about his likely death in that jail, even this belated treatment would not have been possible. Shushil Roy is considered to be the senior most leader of the CPI (Maoist) after the united Party emerged in 2004 and he inaugurated the United CPI (Maoist). 1. Shushil Roy should be unconditionally released forthwith. 2. If his unconditional release is not possible forthwith, he may be allowed to remain a free citizen as long as he is still under trial, so that he can obtain the necessary medical treatment, and receive the due care and attention under the charge of his younger brother. 3. Also, a high-level judicial committee should be constituted to probe, and give a report at the earliest, on the veracity of the charges foisted against him in the remaining cases. The following is the full version of the interview Shushil Roy gave to Indian Express, an English language daily recently. Indian Express (IE): What relations do the CPI(Maoist) have with the Nepal Maoists? Is it still going strong? Sushil Roy (SR): The CPI (Maoist) seeks, as part of its international responsibilities, to have fraternal relations with Maoists and all progressive forces struggling for the working classes all over the world. Nepal is one of them. Specifically today in Nepal there are three Maoist parties to my knowledge. One called UCPN(Maoist) led by Prachanda and Baburam Bhattarai, the other called CPN(Maoist) led by Matrika Yadav who was the first to part with the UCPN(Maoist), and the third, also called CPN(Maoist) led by Kiran, which was formed very recently. Earlier, all the three were within a single party CPN(Maoist). The splits have taken place because Prachanda and Baburam Bhattarai's policies of late amounted to a betrayal of the Nepalese new democratic revolution. To my knowledge, the CPI (Maoist) has had a fraternal ideological and political relationship with the Maoists of Nepal, which entails both unity and struggle on common issues. Whether the Nepal Maoists are still leading the revolution there or have betrayed it, we have common aims and objectives, common enemies in the present phase, and common friends as well. That is the essence of our unity on ideological and political issues. Where we differed on questions related to the strategy and tactics of revolution in our respective countries, we had been having internal or mutual debates, but we do not interfere in each other's actual work, other than politically supporting mutual revolutionary causes. Now, with the formation of three Maoist parties in Nepal, and one of them generally perceived as having betrayed their new democratic revolution, and the two others yet to emerge with effective strategy and tactics to take ahead that revolution, I would think that the CPI(Maoist) would be in the process of reshaping the forms of its ideological and political relationship with the three parties. IE: What has been the West Bengal government's stand towards the Maoists after Mamata Banerjee came to power? SR: The government of West Bengal has been antagonistic and inimical towards the Maoists, both before and after Mamata came to power. While she was in the Opposition, Mamata, to begin with, tried to feign as if the Maoists had no significant present at all. Then, as the elections drew closer, and Singur, Nandigram and then the Lalgarh peoples' resistance movements emerged as a big force, she realized that with the support-base of the Maoists widening and deepening, it would be beneficial to pose as a supporter and sympathiser of them. Then again, when she came to power, when she had the props of the state with its repressive apparatus of police, paramilitary and armed forces, and draconian laws, as well as the court, colonial bureaucracy etc. to hold her in power, she had no need any more to elicit the support of the masses rallying around the Maoists, or the support of the radicalised intelligentsia of Bengal. She, therefore, did a quick somersault on occupying the chief minister's chair and began to show her true colours as regards the Maoists. The brutal murder of Kishenji, the beloved leader of the Indian revolutionary masses, left no doubt about her real political and military character. IE: Is the government sympathetic towards them? Is any government sympathetic towards the Maoists? SR: No question of that. There is not a single government in the country which could be sympathetic towards the Maoists. That is reflective of the strength of the Maoists. Only the masses are sympathetic. IE: Something about Mamata Banerjee's policies? SR: Mamata's policies are as anti-people as that of any other party of the exploiting and ruling classes. Today if she feigns opposition to the UPA's thrust towards foreign direct investment in retail, broadcasting and civil aviation, it is only because she wants to save face in the run up to the 2014 Lok Sabha elections, after using the UPA prop to acquire a larger political stature. She is an opportunist par excellence. There should be no difficulty in seeing through her dramatics and histrionics. She has learnt a lot from her predecessors who ruled West Bengal for so many decades. IE: During the panchayat elections will you set up dummy candidates? SR: Why would any Maoist party set up any dummy candidates? As far as panchayats are concerned, we Maoists believe that they are first an extension of the corrupt, exploitative, oppressive and repressive state. Panchayats generally serve to preserve feudal power in the villages, and imperialist, feudal and comprador bureaucratic bourgeois rule as a whole, down to the grass-roots. The only way is to launch and intensify the revolutionary class struggle at the grass-roots, and in this way build revolutionary peoples' committees at the local levels. That is how the Maoists believe in letting the toiling masses take over power from those who exploit and oppress them, right from the panchayat to the parliament. IE: What is the biggest hurdle for the Maoists in the present day? SR: Especially in Chhattisgarh, Jharkhand, Odisha, West Bengal, Bihar, Andhra Pradesh and some areas of Maharashtra, Madhya Pradesh etc., the state, with its heavily armed forces, and now with the direct involvement of the Army and the Air Force, has been encircling and suppressing the people in its efforts to wipe out the Maoists and their supporters by the thousands. This encirclement and suppression entails extremely brutal and inhuman attacks on the poorest of the poor and on their most devoted leaders and soldiers. Such cold-blooded, pre-meditated attacks are accompanied with devious means to wean away the weaker cadres to different rival formations, and with draconian laws to arrest at will and detain for long periods, also for life, and inhuman torture in custody, etc. Intelligence agencies are proactively managing the media to plant and spread false stories. These are all the major hurdles today. In addition, the Maoists have to consistently wage an internal struggle against whatever non-proletarian trends may remain and emerge within their ranks. Overcoming all the internal shortcomings and weaknesses is also a major challenge before the Maoists as they gear up to take on these biggest ever onslaughts in the history of the Indian new democratic revolution. IE: Is there a setback for the Maoists in Bengal and Jharkhand? SR: I am not in a position to make any such assessment. Inside jail, I only had newspapers and some magazines as my sources. I had no proper information. Even now, when I am under medical treatment at the AIIMS, Delhi, I have hardly any information. But what I can safely say on the basis of whatever I have been able to gather until now is that the Maoists in Bengal and Jharkhand are faced with a full-scale war, whose intensity and viciousness are increasing constantly. It is a terrorist attack by the state against the downtrodden people, the adivasis, poor peasants and their beloved leaders. The Maoists are at the forefront of this war against the Indian people, whether in Bengal, Jharkhand or anywhere else. The circumstances of this war are tough and adverse. But I am hopeful that the Maoists, armed as they are with the ideology of the working class, the proletariat, they will have behind them the tremendous moral strength of history and the love and support of the masses. On this basis, they will develop the appropriate political and military tactics, in order to gain victories and turn any defeat into victory, and failure into success in their overall strategy of this current phase of new democratic revolution in our country. IE: Do the Maoists take active help from the North-Eastern groups? SR: The Maoists support the struggles for self-determination, including the demand for secession, which are being waged by different nationality movements in the North East. Some of these nationalities, and their organisations may support the Maoists politically, just as the Maoists support them. If you are talking about active military help, as of date, I don't think there is anything like that actually taking place. But the Maoists would welcome whatever political support these democratic, progressive and radical movements may offer. They would also look forward to broadening the sphere of mutual help and co-operation in the future, not only with the North-East, but also with the Kashmiris, and also with various persecuted minorities, such as the Muslims. IE: Since you are a political prisoner, did the government extend any help to you? SR: The government did not extend any help to me while in jail. In our country, there is no official recognition to political prisoners like us. Unless we fight for our rights, we are treated like animals, like dogs. Whatever treatment I am getting here at AIIMS is just the human right of any prisoner. But with me there was also an attempt to let me die out of utter neglect and lack of medical care, first in Chaibasa jail, then in Giridih jail and worse still, at the government hospital RIMS in Ranchi where I spent 15 days in excruciating pain and squalor. I would have died there if my dear ones would not have taken up cudgels for me, and if various democratic rights organisations had not lent their support in Jharkhand, from West Bengal, Delhi and other parts of the country. Without struggle from within and support from outside, a political prisoner has no hope, no entity. IE: Are the Maoists willing to reciprocate P Chidambaram's offer to surrender arms and then come to talking terms? SR: Why should the Maoists surrender the arms which actually belong to the people of India? Chidambaram's talk about surrender of arms was just empty rhetoric. He did not want any talks with the Maoists. Surrendering arms would mean entirely giving up the struggle. For talks, we can at the most talk in terms of putting one's arms on hold. That is, a mutual cease-fire or a cessation of hostilities to some extent. Asking the Maoists to give up arms while the state actually stepping up its Operation Greenhunt - that was nothing but double standards. What the Maoists were asking for was putting the military operations of the state against the people on hold, and working at the modalities of a mutual ceasefire and such things. In West Bengal the Maoists even carried out a unilateral ceasefire for a whole month to pave the way for talks. But all governments have been betraying anyone who hopes for talks by unilaterally continuing attacks while the Maoists put their arms on hold. This is the real obstacle to talks - the governments in power and not the Maoists. IE: What do you think about the Bijapur massacre? SB: In Bijapur in Chhattisgarh, it is now well known that 20 unarmed adivasis from three neighbouring villages were massacred by the paramilitary forces. Such a massacre speaks volumes about the training that the paramilitary forces are getting from Israeli and US imperialist agencies and to what extent the Indian state, at the behest of its imperialist masters, considers the people of India as its enemies. The unarmed adivasi peasants had gathered in their own village to discuss the modalities of the forthcoming sowing season for their paddy. In an area of influence of the Maoists if the toiling masses get together to take their own decisions collectively and democratically, it is not tolerated by the state. This is because the state today does not tolerate the practice of democracy by the toiling masses. 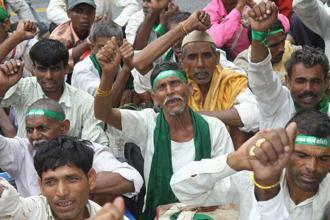 The state does not want the toiling masses to take their own decisions regarding their agriculture-based economy. This shows that the rulers can go to any extent to demonstrate that they can only allow their imperialist masters to control and direct the country's economy, not the people of India backed by the Maoists. IE: Anything else you would like to share with the readers? SR: Yes, a lot. First thing is about how to read newspapers, how to view TV channels. Most newspapers and TV channels are so run that the realities get distorted. The ideas, which the ruling elite ascribe to, are propagated vehemently, even unethically. Therefore, one has to perceive the news and the news analyses that we see in the newspapers and TV channels very intelligently. Conscientious reporters and editors in today's dominant media have become an endangered species. Secondly, what I wish to say is that if your readers wish to know what is the actual situation on the ground as regards the struggle between the Maoist-led peoples' war and peoples' movements on the one hand and the repressive forces of the state on the other, one will have to actually go and see for oneself, and see with an open mind. Thirdly, it is important to understand that whether you are a Maoist or not, what our country needs is freedom from the shackles of imperialism, feudalism and comprador bureaucratic capitalism. All the woes of the Indian people are rooted in these three evil "isms", which pervade every nook and corner of our subcontinent. The only answer is a new democratic revolution based on an agrarian revolution carried out by armed peasant masses, motivated and led by the ideology of the working class. Last but not the least, readers must learn to distinguish between the truth and the stories fed or simply planted by the police and their intelligence wings and not get influenced by the police's lies and distortion of the reality. Indrajit Dasgupta was so annoyed hearing Sushil Roy's questions that he asked him to leave the general body meeting. That discussion, and many other meetings and debates before and after that made clear to him that the CPI (M) would never fight for revolution. Publicly for show it was supporting the Chinese Communist Party but in reality it will follow the parliamentary line of the renegade Khruscheve and Dange. The events of the Peasant struggles of Naxalbari, the police firing which killed eleven woman peasants including two children, and the anti-democratic and revisionist character of the party leadership, made him cut off all relations with CPI (M) in 1968. For the sake of revolution he left his permanent job, home, and relatives to work as a professional revolutionary in faraway villages. Since 1990 he confined his activities to doing ideological, theoretical and political work within the working class in the industrial areas of Kolkata, Howrah and Hoogly, from where he was arrested on 21st May, 2005. Sushil Roy in this letter written in July 2006 from prison in Midnapore in West bengal, translated from the original Bengali, he is challenging Buddhadev Bhattacharya to a political-ideological debate. To Shri Buddhadeb Bhattacharya, Chief Minister, State of West Bengal. The subject matter of this letter to you is very important and deserves much elaboration. However, in view of the value of the time at your disposal I would only briefly draw your attention to a few points. The contents of my letter are absolutely political and I bear no personal grudge. On 17 March 2006, the Jhargram Session Court sentenced me to 5 years' rigorous imprisonment on charges of sedition under the Arms Act and 121-A /122/124 B Indian Penal Code. I am 68 years and 6 months now. In 1995 Dr. Sunil Bagchi, the well-known eye surgeon, operated on both my eyes for removal of cataract. However, for some reason my left eye was completely damaged immediately after the operation. For the last two years I have often been suffering from intermittent haemorrhage of the other eye too, because of hypertension. So there is a chance of my getting completely blind any time. Moreover, I suffer from Ischemic heart disease, enlargement of the prostate glands, piles with regular bleeding, constipation etc. I am being treated at the jail hospital for these ailments. From the daily Pratidin of 29 June 2006, and later from my lawyer I learned that the State Government has appealed to the High Court pleading for my life imprisonment. I have some questions and some comments on this role of the present State Government, which I am presenting before you through this open letter. Kindly give it a patient reading. So far as I know, the Acts and Indian Penal Code of 'independent' India are following the colonial Acts formulated by the British imperialists. The lawyers also concur with me in this. The 'Independent' and 'Sovereign' Government of India has not formulated any new Act of the IPC. The British imperialists had formulated those Acts to sustain their colonial regime and to ruthlessly suppress the Indian people and the Indian revolutionaries fighting against their barbarous rule and exploitation. It was on the strength of these Acts that the despotic British ruling class had dubbed hundred of great patriotic revolutionaries like Surya Sen, Khudiram, Bhagat Singh, Dinesh Gupta as 'terrorists' and sent them to the gallows or to life imprisonment in horrible prisons like the Andaman, where many of them were pushed to death. In the backdrop of this historical perspective, a number of questions naturally arise. The 'independent and sovereign' democratic Government of India as well as the left democratic government of West Bengal are using the same Acts promulgated by British imperialists to dub as 'terrorists' and 'extremists' and suppress those workers, peasants, intellectuals and other toiling masses fighting against the exploitative rule and hegemony of the big bourgeoisie and big feudal lords of India, who are nothing but the compradors of various imperialist forces under the leadership of USA, the chieftain of the neo-imperialist gang. These workers, peasants, intellectuals and other toiling masses are being thrown into prison for life. The question is, are our independence and sovereignty a hoax, a mere formal announcement made to hoodwink the people? Are our democracy, our law and judiciary still a legacy of British colonialism? Are they still being forced to follow the footsteps of the British and other imperialist foreign masters by being dependent on and committed to the laws and the judicial system instituted by them? The parliament, the law, the judicial system, the administration, the jails of a sovereign independent nation .... are all these under foreign tutelage? Have the MP's and MLA's of the left-democratic government of West Bengal ever raised their voice against this in the parliament and in the assembly? I am really eager to know this. The British government had even charged Netaji Subhash Chandra Bose with sedition and arranged for his death sentence. And yet, the people of India have being paying their homage to Subhash Bose and other revolutionaries of the Fiery Age as great patriotic revolutionaries. Thus, the ruling class and the ruling parties do not have a monopoly in defining who is a patriot and who is a traitor. It is the people's verdict that determines the true definition. As the ruling party you are branding certain people as traitors and terrorists. But you are not doing so as a citizen of an independent and sovereign country. Your evolution is based on the fact that you are a part of the puppet ruling clique bound by the foreign neo-colonial chain. According to a Marxist evaluation, in a class-divided society all ruling parties, irrespective of whether they call themselves 'communists' or 'social democrats' or 'leftists', are guarding the interests of native and foreign exploitative classes. Has the left front government of West Bengal in its active politics and practical policies been able to take any position different from those of the Congress, BJP and other rightist parties? None of the two 'communist' parties, CPI and CPI (M) appear to have taken the slightest interest in adopting a different position in this matter. In this context it will be proper that I should briefly inform you about my identity. "Janganatantra, amader mantra" (Peoples' democracy is our mantra). My query was: a mantra is something to be chanted orally, it has got nothing to do with practical application. Does it then imply that we would continue to chant the mantra of revolution without ever applying it in practice, as did China and Vietnam? Shall we never carry out ideological, political, organizational and military preparation for the revolution? Comrade Dasgupta was so inflamed by my question that he ordered me to get out of the G.B. meeting. From that meeting and from many other conferences and debates it became clear to me that the CPI(M) would never carry out the revolution. While apparently it would support the Chinese party, actually it would toe the same parliamentary line followed by Khrushchev-Dange renegades. The Naxalbari peasant struggle, the firing by the United Front government and the death of 11 peasant women, including two children, revealed the true social-democratic and revisionist nature of the party leadership. So I left all connections with the party and urged, by the revolutionary vision, in 1968 I went away to a remote rural place to work as a professional revolutionary leaving behind my permanent job, my home and my close ones. Since 1990, I had been engaged in doing ideological, theoretical and political work among workers exclusively in the Kolkata-Howrah-Hoogli belt. On 22 May 2005, at about 7 p.m. I was coming out of a workers' ghetto, (No. 4, Madrari Gate) near Konnagar station and boarding a rickshaw, when 4/5 plainclothes policemen jumped upon me and forced me to get into a private car waiting nearby. They blindfolded me and took away a handkerchief, a comb and a money bag from my pocket. I did not have anything else. After driving nightlong, they took me to a pucca two storey house in a jungle area. That was actually a BSF camp, housing 150 BSF men. There on 22nd and 23rd May two police officers interrogated me day and night. On the 24th at 8 a.m., I was taken to Belpahari police station and produced at the court on the same day at 10 a.m. They had my face covered with a piece of cloth. Later, the police F.I.R. report showed that I was arrested while conducting a meeting on the night of 23rd May at Tamajuri village under Belpahari P.S. and that they had confiscated from me a small torch and a handbag. Never in my life had I been to Belpahari, nor heard of Tamajuri. Why this falsehood? When I asked Mr Shyam Singh, a DSP officer (it is he who had interrogated me most), he said, 'This is a part of our tactics.' Later somehow the police could know about my rank in the party. The DSP said, 'You are not divulging anything, only telling stories. We will involve you in such a case that you will have to rot your whole life in jail and die there.' I believe the police conspired with the state government and involved me in a serious case. With that end in view they produced a seizure list before the court, which showed that explosives, cartridges, computers, cassettes, photos, money, ornaments, Marxist literature, and documents have been seized from a house in Hind Motors. On the basis of these they started a case of sedition against me under the said sections of the IPC. Yet again I was surprised, for I have never been to that house in Hind Motors. The police dragged me in the net of those seized items and started a false case against me. Later I came to know that the police had arrested some Nepali Maoists in India and seized some items from Maoist workers and sympathizers in West Bengal before and after my arrest, on the basis of which they prepared the seizure list against me. This skulduggery of the democratic police of West Bengal has left me dumbstruck. In the area where I do my political work, there is no case against me. Nor is there any reason why there should be any case against me, given the nature of my work. The Special Force team from West Medinipur has literally kidnapped me and involved me in a false case at Belpahari. There are some more cases against me, in various other police stations in West Medinipur. The local police station, even the district S.P. himself does not know anything either about my arrest or about the items produced in the court as having been seized from the said Konnagar house. They told me so when they interrogated me. My question is, whose interest are the police upholding by thus framing false cases against me? Does this add glory to the Police Department, the judiciary or the state government? Moreover, the police are arresting Maoist workers and sympathizers from various districts, framing them in false cases and keeping them in jail. In the left democratic regime the police are resorting to the same physical and mental torture on the workers (beating up, burning with cigarettes, not giving drinking water, not allowing the use of toilets) as they did in the reactionary Congress regime. Arrests, beating up, transfers, breaking roof tiles, ovens and other utilities with rifle buts, pouring kerosene or sand in cooked rice and curry, mixing up rice and dal, addressing old men and mothers in awfully abusive language, kicking them down, violating the modesty of young women - all these brutal tortures are going on unabated in the militant areas on the people for supporting the Maoists. CRP personnel from outside and local CPI (M) men take the lead in these matters. I know that the reports of these evil practices of the police and the para-military forces do not reach you. After my arrest, apart from West Medinipur, many high-ranking police officers from various states (CID IG/DIG/SP/DSP, Andhra Pradesh, Orissa, Jharkhand, Delhi, Kolkata) have interrogated me. During interrogation I was subjected to various kinds of mental torture and many a time I fell ill. However, I will not deny that nobody tortured me physically. Probably that was due to the appeal made by the progressive intelligentsia of West Bengal to you after my arrest so that I am not subjected to physical torture. Time and again you have declared that you will tackle the Maoist movement politically. And yet, in the militant Maoist areas you have no political activity. The Maoists are fighting against the repression of the reactionaries and for just demands. More and more oppressed people of the area are joining them in their programme and your party is losing its foothold. In this situation, in order to break up their struggle and their organization, the local leadership and the cadre of your party, instead of tackling them politically, are terrorizing the people of those areas by resorting to torture, arrests and oppression with the help of hoodlums and the police, just like reactionary feudal lords. The local leadership and cadres have taken up the role of social police and the Communist Party (?) workers are acting as police spies. In the past hundreds of workers and masses of your glorious party have defied police firing and the pains of incarceration and set shining examples of selfless and all-sacrificing struggle by remaining loyal to the great party ideology. Can you imagine how much the leaders and cadre of your party have been corrupted by power, so that to maintain a consumerist luxurious life they have been reduced to police spies of a state which, according to your own characterization, is a "bourgeois-landlord" one? Alas, Marx. Needless to say, revolutionaries had long ago disdainfully rejected this poisonous weed-like line, originally propounded by the renegade Khruschev in the international communist movement. In India the traitor Dange was its chief proponent. Right from the moment of birth, your party has been working along this line. Suffering from a petit bourgeois mentality typical of the middle class, the leaders and cadres have confined themselves to a secure lifestyle. Thus, they limited all their struggles to 'secure some benefit' and to press only for those 'realisable' demands that are 'acceptable' to the ruling and exploiting classes. That is why, after the party came to power, in keeping with the inexorable class character of the petit bourgeoisie the leaders and the party workers fixed their eyes solely on winning elections. Naturally they have veered 180 degree from the path of the mass revolution - psychologically, politically and organizationally. They are now steeped in personal and group corruption, mud-slinging and murderous activities in order to remain in power by grabbing lucrative ministries. The local offices of the party are no longer centres of studies in Marxist books and Marxism-Leninism. Factional quarrels and murders for grabbing promotorship and contractorship by getting hold of the lucrative departments are commonplace there. At the local, zonal and district level committees the contradictions and debates are no longer on party line or the road to revolution, but on who would lord it over in the area, mafia fashion. Although you, Biman babu and a few others in the party have an honest and clean image, the entire party apparatus has been captured by corrupt people who appease the owners and act as power-middlemen. To get rid of this you may conduct as many rectification campaigns as you wish, but nothing would avail. For the seed that you have sown at the birth of the party was bitter, how can you expect a sweet mango from it now? You must not have forgotten what the great Comrade Stalin taught: 'If the socialists join the ministries in those countries where the old machinery exists intact (i.e. military, police, bureaucracy, law, judiciary, and jails), then however honest and popular they may be, actually they would be able to do nothing save serving the interests of the imperialists and the bourgeoisie against the interests of the oppressed people.' After remaining in power for thirty years, do you feel Comrade Stalin was wrong there? In actual politics have you not in effect been serving the forces of imperialism, capitalism and reaction for remaining in power for the last thirty years? Comrade Lenin had harshly admonished the French socialist Millerand for joining the bourgeois ministry. Currently, you are citing the fall of the Soviet Union and globalization to justify your policy of abandoning principles and being a realist. But this has been your only line of sticking to power for a pretty long time. We know, according to Marxist laws the real policy of the party is determined by the party's basic line. Real policies are formulated under the basic line. The basic line of a Marxist party is 'to capture state power through revolution'. If the real policy of the party deviates from this basic line, then that is nothing but rank revisionism. You must have taken lessons from the tragic ends of the Communist Party of Indonesia in 1965 and Chile in 1973. The Indonesian party leader Aidit and the Chilean party leader Allende had come to power through parliamentary means. In order to acquire experience they made some experiments. They introduced bills in parliament to confiscate the oil companies owned by the US imperialists and to nationalize land. Before the bills could be passed as laws, US imperialism carried out a military coup via the CIA and brutally killed 300,000 communist workers, including the leaders of the two countries, and thousands of progressive people. They had relied on the old military, police and bureaucracy. The communist workers also were absolutely unarmed and the US imperialists took advantage of that. From this terrible history the only lesson you have learnt is if you come to power through parliamentary means and try to sustain that power by opposing US and other imperialists and their agents, the big capitalists and big landlords, then you will have to die. So let revolution and the revolutionary party go to the dogs. For giving some benefits to the masses and to go on winning elections forever, it would be enough to keep the imperialists, capitalists and vested interests in good humour. Looking back, one can see that in 1963 when President Johnson (after the assassination of John Kennedy) came to visit India, the then finance minister Morarji Desai (later known to be a CIA agent) of the Nehru ministry went overboard and told him, "We are opening our (motherland's) womb before the foreign capitalists." His idea was to woo Johnson so that he would invest US capital in India. Needless to point out, by harping on globalization you are now carrying that flag of Morarji's. The party has adopted reformism and the economist politics of 'giving benefits' as a mode of remaining in power. Naturally, it has forsaken self-denial and self-sacrifice and become bogged down into the mire of anti-struggle compromise, corruption and opportunism. So in its dictatorial mood of despotism it is not prepared to tolerate when other parties protest and fight. When struggle develops not under your banner, but under the leadership of some other parties and organizations, that causes fissures in your happy family. Since you cannot tackle them politically, you label them as 'anti-socials', 'secessionists', and 'terrorists' in a haughty zamindar-Iike manner and brutally suppress them with the help of the police and para-military forces of the "bourgeois-landlord" state. This is the counter-revolutionary method you stick to. Steeped in the halo of power you have forgotten that the great Marxism-Leninism is the basis of your party. Of course ideology becomes unimportant when you run a "bourgeois-landlord state". It can easily be thrown away as obsolete and that is exactly what you have done. But then, why continue with the Marxist signboard unnecessarily? I would not deny that in the past communist revolutionaries, while reposing faith in the correct basic line, had committed some mistakes in its application. Extreme hatred for revisionism, revolutionary emotion and inexperience had led them to make some serious mistakes. Because of their dedication to and eagerness for the revolution they had tried to hasten things and paid the price with their own lives. Our homage to their mothers too, who had reared them with their breast milk. As a result of the mistakes committed by these revolutionaries, the party became divided and the revisionists, who serve the vested reactionary interests, took advantage of that. It is while walking on that blood-soaked path that the revolutionaries are learning their lessons anew. They are determinedly raising the revolutionary flag to new heights. Fighting with weak resources against a powerful state machine, some mistakes are still being made. But these are being quickly rectified. They are not doing anything against people's interests. If you come across any such activity, you are welcome to offer scathing political criticism of that. At the same time, do allow the Maoists to openly offer political criticism of your mistakes and anti-people acts. In the war theatre, let a hundred flowers bloom, let a hundred ideas contend. What's there to fear? Neither the Communist Party of India (Maoist), nor any mass organization sympathetic to it or under its leadership is banned in West Bengal. And yet, when they publicly try to simply paste some posters in support of a movement, police arrest them as Maoist terrorists and send them to prison on concocted charges of sedition. Where do we live, Buddha babu - in Bengal or in the jungle? When these things happen in a state run by the Congress or the BJP, such actions are understandable. But when a left democratic government led by a 'communist party' indulges in such reactionary and despotic behaviour, then what do we make out of it? Is it not sheer two-faced hypocrisy under the veil of leftist phrases? In the BJP-run state of Chhattisgarh you have very rightly protested against the barbaric activities of the 'salwa-judum', led by the Opposition Congress leader Mahendra Karma and constructed under Hitler's Gestapo model. The BJP and the Congress have both in many ways enticed the poor tribals through this campaign and held up 50,000 families illegally in concentration camps. The police have formed a spy gang comprising chosen members from among them and have given them military training. By thus dividing the tribal community so that they may hand over or kill Maoists, the police has created a war-like situation in the Maoist-influenced tribal zone. The CPI (M) Polit Bureau has severely condemned this and demanded immediate banning of 'salwa judum', undoubtedly a step deserving congratulation. But what do we find here in West Bengal? Here campaigns such as 'Sankalp schools', dispensaries, tree planting, football matches are being undertaken at the behest of the Police Super, West Medinipur, on the plea of developing public relations. The first point is, the police then agree that they are alienated from the people and that the people hate them. Point two: Are these the duties of the Police Department or the local Panchayat? Here too, the police are organizing small scale 'salwa judum' and enticing the poor tribals in many ways so as to form secret spy-squads who spread hatred of the Maoists among the tribals and hand them over to the police. Thus the police are pitting communists against communities and splitting the tribals (because they support Maoists). Why is the CPI(M) Polit Bureau a silent spectator in the case of West Bengal? West Bengal government has deployed thousands of police and para military forces armed with modern weapons in the militant Maoist areas. They have asked for another 12 companies of para-military forces from the Centre. They are spending lakhs of rupees to bolster the police forces by providing advanced training by army authorities. We fail to understand what political work this force, which has been organized to suppress the just struggle of the people, will do. Surely, nobody would expect flowers instead of bullets will emerge from their gun barrels. Why is the West Bengal government shy of admitting that they have failed to contain the Maoists politically and have started a civil war? The entire responsibility for this rests with them alone. If you really intend to politically tackle the Maoists, then why are you sending thousands upon thousands of armed forces there? You claim that in West Bengal alone your party has 250,000 party workers. Let them go and raise political debates. Let them alienate the Maoists from the masses by campaigning for the just demands. At the same time give the Maoists the opportunity to raise public debates in the villages and cities. Instead of arresting them at sight, give them the opportunity to agitate with their programmes. You are saying that they are carrying arms? Can you tell me which parliamentary party in India does not stock dangerous weapons? There's none. Each of these parties uses weapons to murderous ends. The problem with you is that you do not have political workers educated in Marxism-Leninism. For the long spell of thirty years your party workers have been steeped in opportunistic pursuits. They have managed their own affairs, have become corrupt, apolitical and haughty. They are content with spying for the police, which for them is the noblest revolutionary work. Their sole political activity is confined to raising the slogan: 'People's Democracy is our mantra' in meetings and processions. As a result of the political line followed by your party, revolution has been confined to the secure lifestyle of the petit bourgeois middle class who happily enjoy the warmth of revolutionary excitement. In an attempt to whitewash this opportunism you invite the statesmen of those countries who have captured state power through armed struggle, like China, Vietnam, Cuba etc. and pose hand in hand with these leaders in photographs so as to hoodwink the masses and your workers by saying, 'Look, our party is still on the revolutionary road.' Any comment is superfluous! The state government under your leadership has demanded my life imprisonment. Had the Congress or the BJP been in power, they would have demanded the same. This will encourage the native and foreign reactionary forces - above all, Bush, the Yankee mafia boss. He would be encouraged to reward such a 'good boy' government with more capital. I wish to know, will the left democratic government of West Bengal follow the same path trodden by other governments looking after the profits of the reactionary vested interests, particularly when the nephew of the revolutionary poet Sukanto himself is the Chief Minister? When an old dilapidated ship goes under, thousands of new ones take the voyage. When an old banyan tree dies, in no time thousands of new shoots spring up. Revolutionaries can be killed, incarcerated in prisons, but revolution cannot be killed nor incarcerated in prison. Let the revolutionary ministers of your 'Left and Democratic' government carry on their internecine fight over lucrative departments so as to live happily ever after in security. Let them discharge their 'revolutionary' duty by deploying thousands of armed forces on the struggling masses in the name of safeguarding the holy 'bourgeois-landlord' state by defending its Constitution and democracy. I shall end this letter by wishing you a healthy long life so that you can lead the above task. But I have a small request to you. I hope you will not refuse. As long as I am in prison, and as long as my eyesight permits, please allow me the opportunity to carry out political and ideological debates. Please so arrange that I can get access to the relevant Marxist literature available in the market and the paper and writing material from my family. Do not deprive me of the right to carry out theoretical, political and ideological debates from my imprisoned life. Give journalists the right to publish my writings in Ganashakti and other dailies. Let a hundred flowers blossom. Away with all pests. We are the revolutionary early morning sun. We will usher in spring on earth. Sushil Roy/4300A Prisoner convicted of sedition, Presidency Jail, Kolkata 700029. P.S. I write this letter to you with an open mind and ill health. Hope this will be published in Ganashakti along with your reply. (The same Medinipur court simultaneously sentenced Central Committee Member and West Bengal State Secretary Patit Pawan Haldar (Tapas) and also Santosh Devnath to life imprisonment. Patit Pawan Haldar hails from a lower middle class family and became deeply involved in the revolutionary agrarian movement at a young age. The name of Santosh Devnath is exemplary for his iron discipline and personal simplicity. He refused to falsely implicate any other activists, even when subjected to inhuman torture). RAIPUR: Outlawed Communist Party of India (Maoist) have dropped pamphlets in the areas surrounding Dhaudai in Narayanpur district in tribal Bastar region of Chhattisgarh, opposing President Pranab Mukherjee's visit to Ramkrishna Mission Ashram on November 7. Police sources said the rebel pamphlets called for boycott of the President's visit to the ashram. The rain has softened the dirt lanes in Charkudih. The slim strip of tar that brings me to this tiny village is cracked. In what passes for the village square, a child, too young to be in school, wails as he slips in a pool of muck and dung. Hens are more adroit. The surrounding green is compensatory: Lush fruit trees and knee-high paddy. A short walk away the Subarnarekha river marks the state border in this part of eastern Jharkhand. Across lies a stunning line of cloud-crested hills in Purulia, West Bengal. This is usually a quiet time. But there is already much excitement in Charkudih and 14 neighbouring villages of Sonahatu block. A steel company-among India's top five-wants much of their land. A document I possess marks the details of the plots to be acquired by the steel maker, totalling about 6,400 acres. Embedded in the phrase "to be acquired" is obfuscation, confusion and apprehension far removed from lofty corporate pronouncements; even the ongoing government-and-business versus greens tug of war over land acquisition, resettlement and rehabilitation. This is a tiny story about some farmers' initial encounter with corporate will. By Salman Ravi, BBC News, Raipur -- 14 August 2012 --Tribal or indigenous people in the central Indian state of Chhattisgarh are to be banned from carrying traditional weapons such as sickles, axes and bows and arrows, police say. They say that the move is necessary because of increasing attacks on police and civilians by Maoist insurgents with tribal weapons in public places. The move has drawn criticism from tribal bodies and political parties. They argue that it curtails the rights of tribal people. Maoists are active in more than a third of India's 600-odd districts. They say they are fighting for the rights of poor peasants and labourers.